We at Elephant Holiday Safaris know why you choose to go on a safaris as opposed to many other ideas hence the need for an individual approach to every safaris queston which we definately offer you. We major in 4 x 4 custom designed vehicles that give you the comfort you need to see you through your safaris comforatably and satisfied. Cars with open tops, landcruisers, self driven saloons, Airport transfers. All our vehicles are comprehensively insured. You don't have to bother yourself thiking or trying to remember the small booking you didn't comfirm and recomfirm, just leave that to us and relax, you will be there. You don't want exorbitive rates do you? Let our professional staff take you to the best rate places. You must appreciate that if you need a guide, then this guide must be very knowledgeable and pleasant to deal with. And that is exactly what you will get so that you ensure maximum satisfaction while with us. We guarantee confirmation of Travel tickets payments, travel instalments. 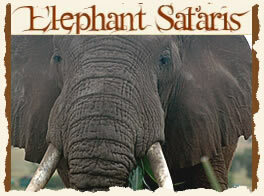 Elephant Holiday Safaris provides quotations which one can pay in instalments.